Happy New Year, and welcome to the fresh start (I don’t know what that means yet as I write that, but that’s the message that wants to come out)! I hope the holiday energy was as good to you as it was for me. It was a joy to be able to slow down the last couple weeks, share food and spend time with loved ones, and reflect on what an amazing year 2018 was. Yes, the growth was there as comes from constantly pushing myself and the rewards have been all the sweeter for it. However, I recognize that for many others, perhaps you included, there is a feeling of being more worn down than normal. It could be the rush of traveling and trying to spend time with all the loved ones, from finishing projects before the end of the year, or getting overwhelmed wondering what the heck just happened this past year with its crazy energy. There were challenges aplenty, and 2018 was a year to experiment with how you approached and dealt with these challenges – in times before, we’d been taught to tackle these obstacles head on with brute strength, with mental force, and a kind of dominant power. The time and energy is changing though, and that approach isn’t working as well because it’s simply outdated. It worked in the past, and may continue to work a bit longer, but such force is not going to be sustainable in the long run. The idea, moving forward, is to gather all the information you have and then move as you’re guided. Sometimes, that will mean taking a step back and actually doing something else for awhile. Sometimes, it’ll mean working on a minor part of the project that you think has little value to the overall work, but in reality, creates the foundation for the whole entire project to rest on. And sometimes, something “like” brute power will be needed, but rather than using the mental power, it will be using the power that comes from the heart. 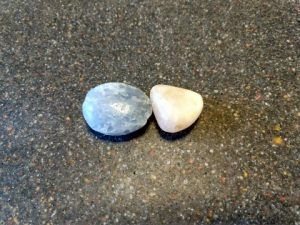 Truth (Blue Calcite) and Loving Kindness (Stillbite) will be the foundation for the year ahead. When all else fails, see if you can keep these two energies in heart and mind as you approach your daily tasks. Is what I do Truthful? Does it support my Truth? Does it support the good of everyone around me? Am I approaching this project / task / situation / person with a warm and loving heart? Can I find forgiveness in this situation that causes me anger, frustration, and pain? Despite or even in spite of all the negativity that continues to surround you and stress you out, you are here and have been tasked with creating good in the world around you. Please don’t fall back on routine, on what has worked before just because that’s how things have worked in the past. This is a new day to a new year. You are, in many ways, born anew each day you wake. Make the most of it and consciously choose the good. God, guide me. Be my thoughts, my words, my actions today. If you keep your highest good and the highest good of others at the forefront in all your actions, you will have even better, clearer access to your intuition and spiritual guides, and you will be directed and shown where to go next, what to do next, how to move forward. Let the gentle loving energies of this month’s crystals help set the foundation for your year. 2019 is going to be your best year yet, if you let it.